The App Close To Our Heart. Man, when that cell phone notifies us of anything, we are all over it. We do NOT want to miss a call, a text, an email, a “like” or a comment. We now wear devices on our wrists to make sure we don’t miss any of the notifications that come across the phone in our pockets. It is so very important to not let someone wait who sends us that text and not stay on top of how many “hearts” or “thumbs up” we get on that latest Facebook post. 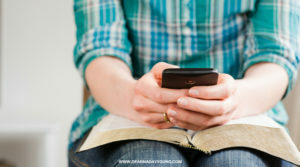 Our life is stored in our cell phones – calendars, pictures, favorite music and daily devotions. We download every app possible to make our life easier which in turn complicates it by the annoying notifications. We sleep with our cell phones. We make sure they are attached to Bluetooth® so we can continue to communicate while doing other things. We take them with us to the bathroom; keep them with us during prayer time; have them next to us while we sleep and make sure to keep them on the table while having dinner. But do we keep the Bible as close to us as our cell phones? When I need an answer to a situation, do I search the Google app on my phone and text a friend? Or do I put down the phone and open up my Bible? I’m ashamed to say the cell phone gets more use than the Bible in my life. I read the Bible every morning and have one in my office at work I reach for occasionally. I love my quiet time early in the mornings and digging into Bible studies and words from Jesus Calling® devotions. But is it enough? We will always rely on cell phones for many different things. They are a great invention and a great way to organize our chaotic lives. But from a spiritual perspective, what gives us more answers? Cell phones or Bibles? There’s no question God’s Word is the way. Let’s ask ourselves this question today and find a way to spend more quality time with the Creator. So, friends, do you keep your cell phone closer than your Bible? This entry was posted in devotional, inspirational, motivational, spiritual on July 11, 2018 by Deanna Young. Great blog! I had not read this one yet and your National Hot Fudge Sundae Day post on Instagram prompted me to visit your blog. You know my love/hate relationship with social media. I am to the point where I try to just go there to look up your posts, my book club, etc. It is just too easy to go down that rabbit hole! I bought a copy of “Jesus Calling” this summer and am loving it. I remembered that Jenna Bush says that she and her dad (George W.) read it each day and connect with each other about what they are reading. I am loving it and read it along with my “Daily Guideposts” and other devotionals. A friend told me about Kathy Lee Gifford’s new book and I have just started it. I think you would like it. I too am guilty of touching my phone more times a day than I touch my Bible. I am trying to be like Kathy Lee and seek God first before doing anything else. The exercise will have to wait! She gets up at 4 a.m. to have her prayer time for one hour! Thanks for your daily reminders, Deanna, and thanks for giving me an excuse for a hot fudge sundae! Thank you for those words. I saw Kathy Lee Gifford had a new book. I will have to check it out. Jesus Calling is definitely a go-to devotion for my friends and for me. I’m glad you are enjoying it. Enjoy your hot fudge sundae also! 🙂 It’s my favorite POURED over mint chocolate chip ice cream! YUM YUM!